Disclosure: I was provided press materials for Life, Animated, and was invited to screen the documentary. I’ll admit, what first attracted me to the opportunity to screen Life, Animated were the words “Disney films”. If you know anything about me and this blog, you know I’m a huge fan, and I really wanted to know about the role they played in Owen Suskind’s life: which films where his favorites? How did he relate to them? And did Disney “magic” really help Owen? I’m glad to report that Director Roger Ross Williams’ documentary answered these questions and more. Life, Animated is adapted from the book Life: Animated, A Story of Sidekicks, Heroes, and Autism written in 2014 by Ron Suskind, Owen’s dad. As told via home movies, Owen was a typical toddler: he was a chatty, curious boy who happily played Peter Pan vs. Captain Hook with his dad in their backyard. One day, he stopped speaking, sleeping, and even regressed developmentally. His family was at a loss, and felt like their little boy “vanished”. Owen loved Disney movies, and that’s all he would watch: intently, fixated on the characters and scenarios of family favorites like Peter Pan, Bambi, Lion King and The Little Mermaid. His family discovered that via these beloved films, using dialogue and characterizations, they could communicate with Owen in a way they hadn’t been able to in a long time. 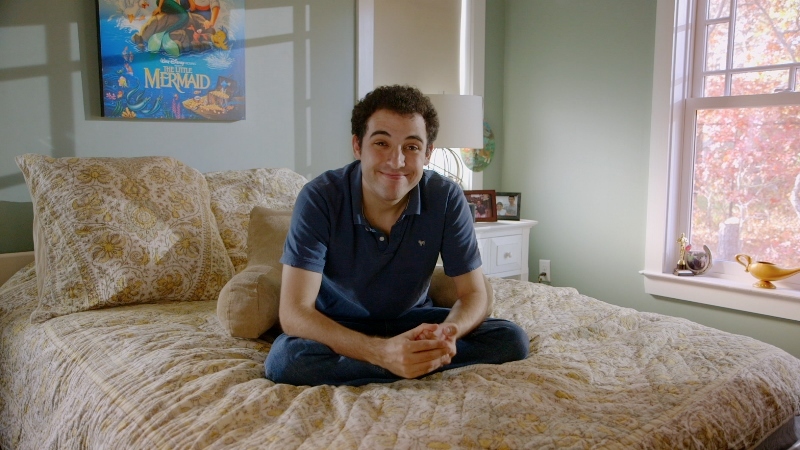 Life, Animated takes viewers on Owen’s journey with autism, from diagnosis as a toddler to becoming an independent adult, and how the world of Disney films allows not only for his family to communicate with him, but for him to process and understand the complexities of growing up and becoming an independent adult. Throughout the course of the film, we see Owen graduate from a special school for older students with different abilities, and prepare for living on his own, getting a job, and the struggles of being in a relationship. The film tells Owen’s story with empathy and warmth, using home movies, interviews with Owen and his family, and Owen’s own drawings. It gives viewers a chance to see the challenges Owen has faced since his autism diagnosis in the 1990’s, a time when autism was just becoming a recognized cognitive disorder. Life, Animated tells how the influence of Disney movies in Owen’s life, along with his family using this “Disney therapy” to help him prosper into adulthood, allows Owen to not only find his way through life, but find himself too. Life, Animated is rated PG, and opens in the South Florida market on September 2nd. For a list of venues across the country, click here. This entry was posted in Disney, Movies, Parenting. Bookmark the permalink. This documentary brought me to tears. It was everything you say and more. It hits me hard because I can relate to a lot of things mentioned in the movie, due to my own son’s journey with autism. He graduated high school this year, and has begun the transition to what will be the rest of his life. I can’t recommend this movie enough.